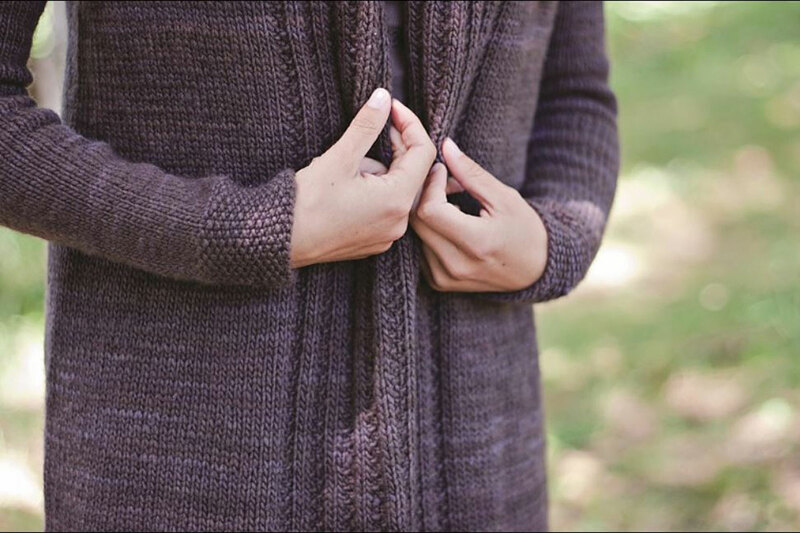 Taken from: Malabrigo - Book 12: Elements "Terreno" - From the designer: "This open and flowing cardigan begins with the collar and proceeds seamlessly into the yoke. You then divide for the Body and Sleeves and work towards the hem. Sleeves are picked up from held stitches and complete the piece." Size US 9 needles (or size needed to obtain gauge) are required but not included. Notions required but not included: crochet hook, stitch markers, stitch holders, and a tapestry needle. Gauge: 17 stitches and 22 rows = 4". Color Shown: 69 Pearl Ten. $127.75 -- Kit price including yarn and pattern book. $143.15 -- Kit price including yarn and pattern book. $138.60 -- Kit price including yarn only (no book or pattern). $158.55 -- Kit price including yarn and pattern book. $154.00 -- Kit price including yarn only (no book or pattern). $173.95 -- Kit price including yarn and pattern book. $169.40 -- Kit price including yarn only (no book or pattern). $189.35 -- Kit price including yarn and pattern book. $184.80 -- Kit price including yarn only (no book or pattern). $204.75 -- Kit price including yarn and pattern book. $200.20 -- Kit price including yarn only (no book or pattern). $220.15 -- Kit price including yarn and pattern book. $215.60 -- Kit price including yarn only (no book or pattern). $235.55 -- Kit price including yarn and pattern book.